(Bloomington: Indiana Linguistics Club, 1993). “This is an innovative and widely influential work, which [Roy Andrew] Miller repeatedly dismisses as Unger’s ‘still unpublished’ dissertation, despite the fact that a paperback edition has been available for purchase since 1977, and a second edition appeared in 1993, with interesting new remarks in the preface.” –Samuel E. Martin, Consonant Lenition in Korean and the Macro-Altaic Question (Honolulu: University of Hawai’i Press, 1996) p. 72 n. 5. 2008 The Role of Contact in the Origins of the Japanese and Korean Languages. Honolulu: University of Hawai’i Press. 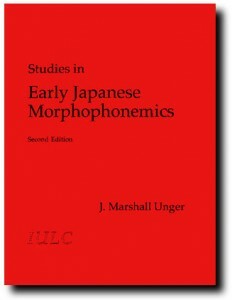 2008 Early Japanese Lexical Strata and the Allophones of /g/. Proto-Japanese: Issues and Prospects, ed. Bjarke Frellesvig and John Whitman, pp. 43–53. Amsterdam: John Benjamins. 2008 Dating the Collapse of Kō-Otsu Distinctions and the Status of /mo/. Current Issues in the History and Structure of Japanese, ed. Bjarke Frellesvig, Masayoshi Shibatani, and John Charles Smith, pp. 339–50. Tōkyō: Kuroshio shuppan. 2005 When was Korean First Spoken in Southeastern Korea? Journal of Inner and East Asian Studies, vol. 2 no. 2 pp. 88–105. 2004 Alternations of m and b in Early Middle Japanese: the Deeper Significance of the Sound-Symbolic Stratum. Japanese Language and Literature, vol. 38 no. 2 pp. 323–37. 2001 Layers of Words and Volcanic Ash in Japan and Korea. Journal of Japanese Studies vol. 27 no. 1 pp. 81-111. 2000 Reconciling Comparative and Internal Reconstruction: The Case of Old Japanese /ti ri ni/. Language vol. 76 no.3 pp. 655-81. 1990 Japanese and What Other Altaic Languages? Linguistic Change and Reconstruction Methodology, ed. Philip Baldi, pp. 547-61. Berlin; New York: Mouton de Gruyter. 1988 Middle Chinese Syllable-Final Stops in Sino-Japanese: A Critique of Vance’s Theory. Journal of the American Oriental Society vol. 108 no. 4 pp. 627-31. 1983 The Classification of Old Japanese Adjectives, with Yooko Itoo Tomita. Papers in East Asian Languages vol. 1 pp. 52-65. 1980 Etymology of the Word /kana/. Papers in Japanese Linguistics vol. 7 pp. 173-84. 1980 Revision of Proto-Korean-Japanese *s. Korean Linguistics vol. 2 pp. 91-96. 1978 Intuition and Rigor: More on Kô-type O-ending Syllables in Old Japanese. Papers in Japanese Linguistics vol. 5 pp. 337-92. 1975 On the Kô-type O-ending Syllables of Old Japanese. Journal of the Association of Teachers of Japanese vol. 10 nos. 2-3 pp. 201-207. 1974 Dôshi katsuyôkei no kigen shiron [Initial Theory of the Origins of Japanese Verb Conjugations]. Abstract. Kokugogaku no. 98 pp. 81-82. 1971 Evidence of a Consonant Shift in Seventh-Century Japanese, with S. Robert Ramsey. Papers in Japanese Linguistics vol. 1 no. 2 pp. 270-95. 1997 A Case Study in Diachronic Phonology: The Japanese Onbin Sound Changes, by Bjarke Frellesvig. Diachronica vol. 14 no. 2 pp. 363-66. 1997 Japan’s Name Culture, by Herbert Plutschow. Journal of Japanese Studies vol. 23 no. 1 pp. 206-10. 1995 Diversity in Japanese Language and Culture, edited by John C. Maher and Gaynor Macdonald. The Times Higher Education Supplement (London), 25 August. 1982 The Genetic Relationship of the Ainu Language, by James Patrie. Papers in Linguistics vol. 15 no. 4 pp. 317-20. 1981 Origins of the Japanese Language, by Roy Andrew Miller. Journal of Asian Studies vol. 41 no. 1 pp. 145-47. 1974 The Phonology of Eighth-Century Japanese, by Roland A. Lange. Canadian Journal of Linguistics vol. 19 no. 2 pp. 217-24. 1973 Japanese and the Other Altaic Languages, by Roy Andrew Miller. 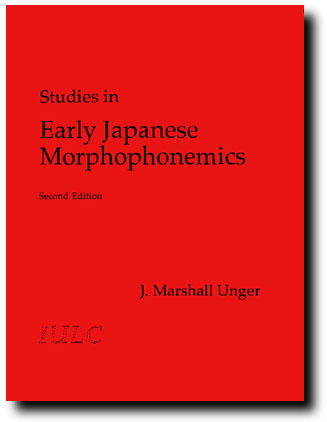 Papers in Japanese Linguistics vol. 2 no. 1 pp. 155-69.